Every two years the United Nations compiles a study of e-governments in countries across the globe to measure the use of technologies for public services. In a 2018 ranking, Moscow finished on top. The UN study analyzes the scope and quality of online services, telecommunication infrastructure and human potential. In this ranking of 193 countries, Denmark, Australia, and South Korea took the leading positions. In 2018, for the first time the study also focused on the development of local e­-government in 40 cities across the world. 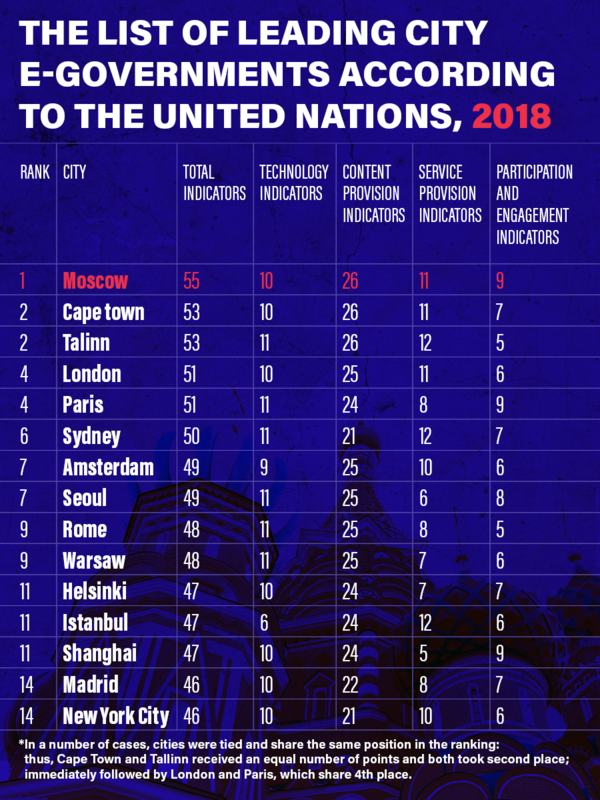 Moscow topped the ranking, followed by Cape Town (South Africa) and Talinn (Estonia) tied in second place. Third place is shared by London and Paris. According to the UN, the study of 40 cities included “an assessment of municipal portals of 7 cities in Africa, 6 in Americas, 13 in Asia, 12 in Europe, and 2 in Oceania.” The study covers all regional groups of United Nations members. The list of leading e-governments include the cities of Sydney, Amsterdam, Seoul, Rome, Warsaw, Helsinki, Istanbul and Shanghai. Last place in the ranking is shared by New York and Madrid. “Moscow is a case study for other Russian cities to replicate the model throughout the entire country in the very near future,” said Andrey Belozerov, Strategy and Innovations Advisor to the CIO of Moscow. The United Nations developed the Local Online Services Index (LOSI) to analyze cities’ performance. Each city was analyzed according to 60 parameters. For example, municipal websites were assessed by criteria such as technology, including basic features, mobile device accessibility and content; also considered were essential online information for health, education, environmental issues, and etc. The city was also assessed by digital services, including those implemented, as well as citizen engagement and e-participation, such as feedback and social network features. As a result, Moscow scored 55 indicators out of 60, which is the highest result in the ranking. According to the UN’s assessment, the citizen engagement criteria is a category where Russia’s capital scored the most. The city received nine points in participation and engagement criteria. In comparison, London and New York had only six points, even though these two global capitals have the same level of technology (10 points) as Moscow. According to the city government, Muscovites frequently use over 222 digital public services provided by city authorities via desktop and mobile. “The locals requested a city service over 259 million times in 2017. In comparison with 2016, the number of requests increased by 31 percent,” the Moscow government said in a statement. Recently, McKinsey Global Institute (MGI) evaluated 50 smart cities based on the latest urban technologies available to citizens, and Moscow was ranked first in Europe. The report was based on a survey of residents in major cities around the globe.